ARRL Audio News on Hiatus for September 21 There will be no edition of ARRL Audio News on Friday, September 21. It will resume on Friday, September 28. Conventional telecommunications are starting to return to normal in some communities affected by Hurricane Florence, but the now long-gone storm set up others for persistent and record-breaking flooding, primarily in eastern North Carolina and along several of the state's rivers. The storm, which made landfall near Wilmington, North Carolina, primarily affected the Carolinas, Georgia, and Virginia. "Things are back to normal communication status, and demobilization is occurring for folks deployed," South Carolina Section Emergency Coordinator Billy Irwin, K9OH, said on September 19. At mid-week, the FCC reported that nearly all cellular service had been restored in South Carolina. Over the weekend, ARES volunteers from several South Carolina counties had pitched in to support emergency communication in the face of power and telecommunication outages and heavy rainfall. ARES Richland County Emergency Coordinator Ronnie Livingston, W4RWL, said volunteers in his county staffed the county Emergency Operations Center (EOC) and Red Cross. operators at the State Emergency Operations Center (SEOC) kept in contact with field volunteers in Marion and Dillon counties after conventional telecommunications failed there. ARES District Emergency Coordinator EMEA Area 3 Earl Dean, W4ESD, said ARES deployed assets as well as personnel who coordinated with the appropriate agencies. Horry County ARES and ARRL South Carolina Section Public Information Officer (PIO) Gordon Mooneyhan, W4EGM, said radio amateurs set up and organized communication networks to assist local government and emergency agencies, as well as to handle health-and-welfare traffic for affected residents, to let their family members outside the affected area know they were all right. In North Carolina, storm surge had caused flooding in many communities. Ham radio volunteers responded in counties along the coast, including Wilmington, Topsail Beach, Jacksonville, and Morehead City, staffing both EOCs and shelters. Farther inland, numerous ARES teams activated in the face of river flooding to address a combination of sheltering needs for local residents and evacuees. Communication throughout the state has been supplemented by neighborhood-based operators, who reported emergencies to county EOCs. The FCC reported on September 19 that nearly one-third of cell service was out in Columbus, Pender, and Onslow counties. The storm also took out several broadcast outlets in the state. The Salvation Army Team Emergency Network (SATERN) activated on September 14 and 15. The net's primary mission was the receipt and delivery of outbound health-and-welfare messages from affected areas. The Hurricane Watch Net (HWN) shut down its activation for Hurricane Florence after 38 hours, shortly after the storm made landfall. The HWN operated on two frequencies simultaneously -- its "home" 20-meter frequency of 14.325 MHz and its 40-meter frequency of 7.268 MHz. "While propagation was not good on 20 meters for the period, 40 meters afforded a fairly consistent contact with stations in the area," HWN Assistant Manager Stan Broadway, N8BHL, recounted. Broadway said nearly 200 stations checked in, and the net took in approximately twice that number of reports, funneling important information via WX4NHC at the National Hurricane Center (NHC). "Many were not at severe levels, but all 'ground truth' [reports] assist in plotting the activity of the storm," Broadway explained. WX4NHC monitored the HWN and the Voice over Internet Protocol Hurricane Net (VoIPWX) on EchoLink Conference WX-Talk, node 7203 or IRLP 9219. While the storm was still out in the Atlantic, ARRL shipped Ham Aid kits to the affected region -- the same ones that ARRL volunteers took to Puerto Rico a year ago to assist with disaster communications following Hurricane Maria. The ARRL Headquarters Emergency Response team activated on September 12 and remained operational into the weekend. W1AW suspended its scheduled bulletin and code practice transmission on September 14. The FCC has granted an ARRL request for a temporary waiver of Â§97.307(f) of the FCC's Amateur Service rules to permit the use of PACTOR 4 digital mode for Amateur Radio communication within the continental US related to Hurricane Florence relief. A formal order addressing the request for a 30-day waiver was released on September 17. Â§97.307(f) of the Commission's Rules limits the digital data emissions of amateur stations operating below 28 MHz to a symbol rate not to exceed 300 baud, and in the 10-meter band (28.0 - 28.3 MHz) to a symbol rate not to exceed 1,200 baud, thus precluding the use of PACTOR 4. PACTOR 4 is a data protocol that permits relatively high-speed data transmission in the HF bands, and many amateur stations active in emergency communications preparedness are capable of using PACTOR 4, which was used to great advantage, pursuant to FCC temporary waivers, in Hurricane Maria relief efforts, and, more recently in preparing for typhoon relief communications in Hawaii. ARRL dispatched PACTOR radio modems with PACTOR 3 and PACTOR 4 capabilities to the Carolinas. ARRL's request proposed limiting the use of PACTOR 4 to radio amateurs in the continental US who are directly involved with the hurricane relief efforts involving the US mainland. "This request is without prejudice to the resolution of Docket 16-239 [the so-called "symbol rate" proceeding], which is presently pending and addresses the rule section discussed herein," ARRL General Counsel Chris Imlay, W3KD, wrote in submitting the request. In the September 17 formal Order, the FCC noted that the "symbol rate" proceeding is currently pending, "but there is consensus among submitted comments for eliminating the symbol rate limits." In response to a 2013 ARRL Petition for Rule Making (RM-11708), the FCC proposed in 2016 to revise the Amateur Service Part 97 rules and invited comments. ARRL had asked the FCC to amend the Part 97 rules to delete the symbol rate limits in Â§97.307(f) and replace them with a maximum bandwidth for data emissions of 2.8 kHz on amateur frequencies below 29.7 MHz. "Tools for the Amateur Station" is the topic of the current (September 13) episode of the "ARRL The Doctor is In" podcast. Listen...and learn! Using Winlink to send emails over the air, using radiograms, introducing the National Traffic System (NTS), and explaining the new ARES online filing system. Presenters would be Section Traffic Manager Pedro Irizarry, KP3PI, and Section Technical Coordinator Carlos Roig, WP4AOH. Constructing NVIS antennas for local HF communication, updating the WP4MR repeater system, where various nets take place, and assembling an Amateur Radio "go-kit" for portable emergency communication. Continuing to build relationships with hospitals and municipal emergency management agencies, as well as maintaining the ones established with the Red Cross and the Puerto Rico Energy Power Authority (PREPA-AEE). 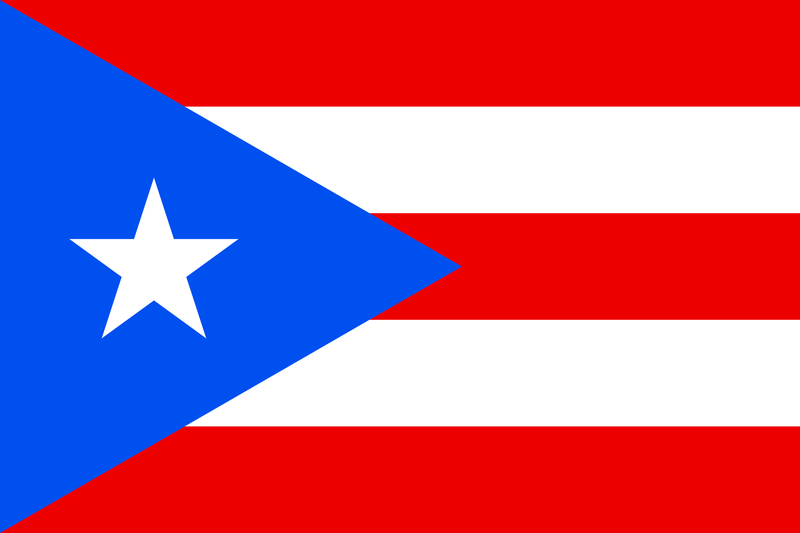 Based on the new Puerto Rico Emergency Management Bureau (PREMB - NMEAD) zone divisions, a 2-meter simplex band plan has been developed, in the event that repeaters go down. Many simplex drills and nets are taking place on a weekly basis. Puerto Rico Section Manager Oscar Resto, KP4RF. At a September 8 meeting, it was decided to create a new formal net for handling formal traffic via the 145.410 MHz repeater located on the El Yunque summit. Radio amateurs living in the US Virgin Islands were invited to participate as well. Eventually an HF net will be available to send formal traffic to the NTS nets in the US mainland. The 2-meter net is set to start on September 24 at 2200 UTC. The 2018 ARRL Simulated Emergency Test (SET) is just ahead. The primary ARRL-sponsored national emergency exercise is designed to assess the skills and preparedness of Amateur Radio Emergency ServiceÂ® (ARESÂ®) volunteers as well as those affiliated with other organizations involved with emergency and disaster response. Although the main SET weekend this year is October 6 - 7, local and Section-wide exercises may take place throughout the fall. Those who already take part in public service and emergency activities are getting ready for the annual SET, a dress rehearsal, next month. But, the 2018 ARRL SET is an open casting call for all radio amateurs interested in expanding their emergency preparedness knowledge and skill. The annual SET encourages maximum participation by all Amateur Radio operators, partner organizations, and national, state, and local officials who typically engage in emergency or disaster response. In addition to ARES volunteers, radio amateurs active in the National Traffic System, Radio Amateur Civil Emergency Service (RACES), SKYWARNâ¢, Community Emergency Response Team (CERT), Salvation Army Team Emergency Radio Network (SATERN), and a variety of other allied groups and public service-oriented radio amateurs are needed to fulfill important roles in this nationwide exercise. The SET allows volunteers to test equipment, modes, and skills under simulated emergency conditions and scenarios. Individuals can use the time to update a "go-kit" for use during deployments and to ensure their home station's operational capability in an emergency or disaster. To get involved, contact your local ARRL Emergency Coordinator or Net Manager. Check on upcoming planned activities through local, state, or Section-wide nets. If you don't know already, find out who the Emergency Coordinator is and where the nearest ARES group meets. Your ARRL Section Manager should be able to assist. The ARRL Public Relations Committee is seeking nominations for the 2018 Bill Leonard Award, which recognizes this year's best newspaper, radio, or television news story about Amateur Radio. The award honors professional journalists or journalistic teams whose outstanding coverage highlights the enjoyment, importance, and public service value that Amateur Radio offers. It was created as a tribute to the late CBS News President Bill Leonard, W2SKE, an avid radio amateur and advocate. Awards are presented in print, audio, and visual categories. Each nominee must be a professional journalist or a professional journalistic team in print, electronic media, or multimedia. The nominee's work must have appeared in English, between December 1, 2017, and November 30, 2018, in a commercially published book, recognized general-circulation (non-trade) daily or weekly newspaper, general- or special-interest magazine (except publications predominantly about Amateur Radio), commercial or public radio or television broadcast (including services delivered via cable), a website operated by a generally recognized journalistic organization (e.g., newspaper, magazine, broadcast station, or network), or multimedia format intended for and readily accessible to the general public within the US. The scope of the work nominated may be a single story or series. Submit entries to ARRL Headquarters c/o Communication Manager, ARRL, 225 Main St., Newington, CT 06111, by 5 PM ET on November 30, 2018. For more information about the award, contact ARRL Communications Manager David Isgur, N1RSN, or call (860) 594-0328. The nomination form is on the ARRL website. Proposals by school and educational organizations to host Amateur Radio on the International Space Station (ARISS) contacts with an International Space Station crew member next year will be accepted starting on October 1. Completed proposals are due by November 15. ARISS anticipates that the contacts will be scheduled between July 1 and December 31, 2019, although crew schedules and ISS orbits determine exact contact dates. A committee of educators evaluate and approve proposals. "ARISS contacts allow education audiences to learn firsthand from astronauts what it is like to work and live in space," ARISS said. "These scheduled contact opportunities are offered to formal and informal education institutions and organizations, individually or working together." Educational proposals should include plans for students to study topics related to space technology, space exploration, or space research, and to learn about communication, wireless technology, and radio science. 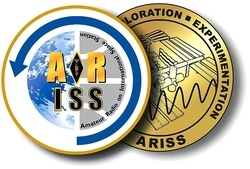 The more advanced preparation educators make with educational plans, the more learning and value the ARISS event will have for students, ARISS said. A Proposal Guide can help in planning and identifying what's necessary to host an ARISS scheduled contact. 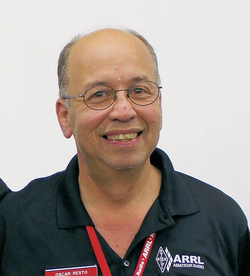 ARRL ARISS-US Delegate Rosalie White, K1STO, quoted one educator who wrote, "Many of our middle school students who participated in and attended our ARISS contact have selected science courses in high school as a result of that contact." Many teachers report setting up ham radio clubs in schools and learning centers because of students' interest prior to an ARISS contact. What is hoped will be the first annual "Get Your Park ON" operating event will take place October 14 - 20, in celebration of Earth Science Week. The event is open to Amateur Radio operators around the world and is sponsored by the national affiliates of World Wide Flora and Fauna (WWFF), which encourages radio amateurs to operate outdoors in protected nature parks. During this on-the-air celebration, hams can participate in one of two ways. North American hams can opt to be Activators, setting up and operating in geological and nature centers, such as national and state parks and forests, national monuments, and protected nature habitats. They also may decide to be Hunters, operating from home and searching out and making contact with the Activators. "We are trying to have parks activated in all states of the USA and Mexico and all Provinces of Canada," the sponsor's Facebook page notes. "Let's have some fun." The week-long special event is reminiscent of ARRL's popular National Parks on the Air (NPOTA) event in 2016, but extends to a larger set of national treasures beyond those managed by the National Parks Service. In October 1998, the American Geosciences Institute organized Earth Science Week, a national and international event to help the public gain a better understanding and appreciation for the Earth sciences and to encourage stewardship of the Earth, a common goal shared by WWFF. Both programs encourage participants to get outside and enjoy nature. "Get Your Park ON" begins at 0000 UTC on October 14 and continues through 2359 UTC on October 20. Visit the "Get Your Park ON" Facebook page for more. Tad Cook, K7RA, Seattle, reports: Sunspots are gone again this week, with none observed since September 12. The average daily sunspot number declined to zero this week from 7.6 last week. Average daily solar flux was unchanged at 68.6, and the average daily planetary A index declined from 12.6 to 9.7, while average daily mid-latitude A index dipped from 10 to 8.3. 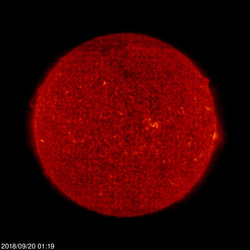 Based on NOAA predictions, solar flux is 68 on September 20 - 26; 69 on September 27 - October 1; 70 on October 2 - 9, and 69 on October 10 - 13. Predicted planetary A index is 5 on September 20 - 22; 16 and 12 on September 23 - 24; 5 on September 25 - 30; 8 and 10 on October 1 - 2; 5 on October 3 - 6; 20, 30, 10, 18, 15, and 8 on October 7 - 12, and 5 on October 13. Sunspot numbers for September 13 - 19 were 0, 0, 0, 0, 0, 0, and 0, with a mean of 0. The 10.7-centimeter flux was 69.6, 69, 68.5, 69.1, 67.8, 68.1, and 67.9, with a mean of 68.6. Estimated planetary A indices were 17, 16, 8, 6, 11, 6, and 4, with a mean of 9.7. Estimated mid-latitude A indices were 17, 11, 7, 5, 9, 5, and 4, with a mean of 8.3. Share your reports or propagation observations.